Social workers and diocesan Caritas volunteers are committed to end social discrimination. Trained in the basics, "community volunteers" help the poor and abandoned find work and fit in the workplace. For Vicar of Thủy Yên, volunteers “are a sign of God's love and the Church’s presence”. 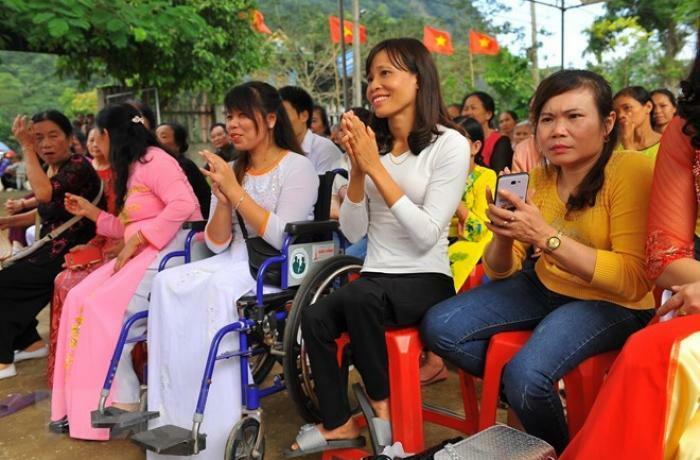 Hanoi (AsiaNews) – Disabled people "need more than money and material things; they also need love, care and attention,” this according to Fr Peter Huỳnh Trọng, vicar of Thủy Yên and head of the social and charity committee in Hải Vân district, Diocese of Huế. Catholics number almost 70,000 or 4 per cent in a population of 1.75 million people. The diocese includes the provinces of Thừa Thiên-Huế and Quảng Trị. In the first province alone, there are 40,000 people with disabilities, according to the latest statistics. Most of them live in precarious economic conditions and their access to training and health care services is limited. Social workers and diocesan Caritas staff are involved in the fight against the social discrimination that touches the disabled, both in the cities and the countryside. In order to empower the disabled and their families, in 2009 Caritas Huế set up a local network of parishes to train volunteers. As Tết Nguyên Đán, the Vietnamese Lunar New Year (5 February) approaches, the humanitarian branch of the Diocese of Huế is working with parishes to encourage Catholics to visit, support and donate to the less fortunate. In 2018, the nine parishes in the Hải Vân district helped 135 people with disabilities. At present, the charity is working to help disabled people, both Catholics and non-Catholics, to fit in to nine local centres in their respective communities. Some 24 “community volunteers” are involved in small projects in the parishes of Phước Tượng, Chánh Xuân, Thủy Yên, Thừa Lưu and Truồi, trained in the basic notions of welfare outreach to help abandoned or very poor people find a job and adapt to the workplace. Last year, the diocesan Caritas also organised a meeting between volunteers and 65 disabled people in order to discuss experiences and initiatives. "We need cooperation and support from parishes and local communities,” said Fr Anthony Nguyễn Ngọc Hà, head of the diocesan Caritas. “Therefore, the role of [our] partners and young volunteers is fundamental ".